I realized that some of my blogging posts have shifted to some more technical topics, but really it’s the brand new bloggers who need the most help. When you’re just starting out, you don’t know who to turn to for help and what you should be doing with your blog. So this week’s Wednesday post is especially for new bloggers as everyone is new at some point. While it’s usually the newer bloggers overlooking this stuff, there are also some not as new bloggers that still stumble on this stuff. Having Unrealistic Expectations – Unless you’ve managed a blog before or know someone who did, you are unlikely to really appreciate what goes into running a blog. Most probably assume it is little more than writing a bunch of blog posts. That couldn’t be further from the truth though. There is a whole other side when you are more serious with your blogging. There is so much technical and marketing work that writing is really only half the battle. It is also tough to understand what a huge commitment it is. You won’t get overnight riches and you don’t just put in a few hours a week. Blogging becomes a very time consuming project when you want it to be something more than just an online diary. You have to be willing to be extremely patient and dedicated to putting in a lot of effort. If you take the right approach that effort pays off down the road, but nothing is guaranteed. Not Dedicated Enough Time to Marketing – This ties in with the unrealistic expectations. You can’t expect a blog to market itself unless you have the patience to toll away it for years waiting for people to find your blog on your own. I’m not even sure that strategy would even work since it would be so difficult for anyone to stumble across your blog if you’re not actively marketing it. If you want your blog to earn some side income or lead to better opportunities, marketing needs to be a major priority. I’ve always put more time into marketing than into writing content because I started my blog with a solid marketing background. I had a decent idea of what would be needed to really grow this blog. Now that I accept a lot of guest posts and have a staff writer, a much greater portion of my time goes into marketing tasks. Getting your blog URL in front of your target audience is a constant process. The same goes with building up search engine rankings. When you’re competing against countless other blogs and websites for rankings, you need a lot of links to show search engines that your posts are more relevant for your target keywords. Being Shy With Fellow Bloggers – When you are marketing your blog, you have to accept that leveraging other blogs is your best bet. When the people who read blogs are already reading other blogs in your niche, those blogs are the perfect spot to attract readers. You could spend hours every day commenting on those blogs, but that won’t attract a lot of traffic and those links are quite weak for SEO. Instead of just commenting on blogs, it pays a lot to get in touch with those bloggers and actually discuss ways of helping each other out. You’ll want to build some rapport first, but as you get to know each other, doors will open for various ways you can leverage their traffic. A lot of new bloggers are scared of taking that first step though. If you instigate a conversation with a fellow blogger, it is rare that they straight up ignore you or are rude in their reply. So get out there and start making connections with fellow bloggers. Although some may be wary of helping someone that can’t help them much back, many others will recall when they were just starting out. They’ll remember other bloggers giving them a helping hand and they’ll pass on the favor. Not Getting On Social Media Early Enough – This mistake seems to be repeated on the majority of new blogs. They might see that other bloggers are on social media, but they either don’t realize the importance of it or they are a little intimidated of starting something they are unsure how to do. They might already find that blogging is a lot of work and aren’t in a rush to add more work to their plate. The thing is, you should at least sign up for social media accounts even before you officially launch your blog. You may not be ready to get active on those sites, but at least allow people to start following you so that you have an audience when you do spend more time on those sites. To start you should at least have a Twitter account and Facebook page. Depending on your niche, a profile on Google+ and Pinterest might make sense too. Just signing up isn’t enough though. Be sure to add some buttons to your blog linking to those profiles. Provide the option for readers to follow your blog on the platform of their choice. I know I have wanted to follow a blog on Twitter, but I just didn’t see profile buttons anywhere on their blog. Don’t assume people will search those sites to find your profile. Making Social Sharing Too Difficult – Along the same lines of getting on social media, you want to make social media sharing as easy as possible. Many people simply won’t share a page on social media sites if the page doesn’t have a button to make it easier. Those social sharing buttons make it easier to share the pages, but it also acts as a good reminder to share if they like the content. For some reason I even see some established blogs making this mistake. I assume they are just going for a very clutter-free design, but why give up that extra source of traffic and positive SEO signals? It sure doesn’t make sense to me. When it’s as easy as installing a WordPress plugin, there is no excuse to not have social sharing buttons on your posts. Using An Ugly Theme Too Long – This mistake is subjective as you can still build up a successful blog with a less attractive design. In my opinion though, a weak design will handicap your efforts. At the very beginning, a weak design might lead to bloggers being more willing to help you out. In the meantime you could be losing visitors due to a negative first impression. You can overcome the negative aspects of a lousy design, but there is no need to put yourself at a disadvantage. Even if a poor design leads more bloggers to help you, there will be just as many that will overlook working with you. Some bloggers will see less potential benefits down the road. If you had approached those bloggers with a more professional looking design, they might see passed how new your blog is. You might appear to be a strong ally to have down the road. When your blog looks great you also develop more motivation to work on it. You become more proud to share your blog with others. It shows people that you’re taking the whole blogging thing seriously and that you’re an up and comer. Using Copyrighted Images – Again this is a mistake that I see bloggers making even after they’ve been around for a while. Usually the excuse is along the lines of ‘but everyone else is doing it’ or ‘it’s not stealing if those images are published online’. Those kinds of excuses don’t justify trying to benefit from other people’s work. Providing a link back to the stolen image’s original location doesn’t cut it either. There are plenty of free images that you can use on your blog, but they have to be explicitly labeled as such. If they are not, the little copyright note at the bottom of the page includes all images. It is not simply fair game, just like it is not fair game for anyone to directly copy your blog’s content. I recommend you use a website called CompFight to find images are that legal to use. If not, you might get an e-mail from the image owner’s lawyer requesting that you take down their stolen images asap. They would also have a right to sue you for copyright infringement. Personally I’d rather not risk that. Ignoring Keyword Usage – Now I wouldn’t say this is something you need to worry about right away. In fact there may be some benefits to ignoring it early on. First of all it would make things a bit easier at the beginning. Secondly your first posts are usually not your best posts. So it’s not such a bad thing if those posts don’t gets direct search engine traffic down the road. At some point though you should get in the habit of strategically using keywords in your posts, particular in your post titles and urls. To show search engines that your page should be relevant for specific keyword phrases, it mostly comes down to keyword usage on and off your blog. If your main target keyword is in your title & url there is a much greater chance that backlinks will include that keyword. Choosing effective keywords to target is an art. You also need to know where in your posts to include those keywords. So I suggest you refer to the keyword related posts mentioned at the beginning of this post. I don’t take the time to carefully choose my keywords for every single post, but you can be sure I do for any monetized page. Using Less Than Ideal URL Structure – Within your WordPress settings you have options on how you want to structure your post url structure. My personal preference is just using the post title and I feel that is the most SEO friendly option. The worst setup you can use is when the post url just uses the post id number. It’s just a wasted opportunity to put your target keyword in your url. Then if you get any backlinks using the url as link anchor text, you are not building relevance for any specific keywords. There is also the option to include the date in the url, but I find that unnecessary. Sure it instantly tells you when that post was published for future reference, but with SEO you don’t want long urls. A long url dilutes your important keywords giving them less weight. It is also less likely to fit in a tweet without using a url shortener, resulting in a missed opportunity for some keyword rich links. Trying to Monetize Too Early – This is actually a piece of advice that I wasn’t too accepting of early on. My thinking was that I might as well get my audience accustomed to there being advertising on my blog. I thought I’d also make at least a bit of income during that time. I was completely wrong. To do well with ads on your blog you need either a high volume of traffic or you need extremely targeted traffic. Both of those conditions are unlikely for the first several months…possibly the first 6 – 12 months. So putting ads up too early just wastes time and can lead to frustration. You might as well focus on stats that you can realistically improve during the first year. Other bloggers may be more willing to cooperate with you if your blog is less monetized too. For some reason some bloggers are turned off by advertising on blogs. I don’t quite get it, but it is the way things are sometimes. So you might as well focus on creating solid content and building up the marketing of your blog. It will turn out to the better route in the long term. I probably could’ve expanded this list to 20 mistakes, but then it starts to get judgemental. For some things there is no right and wrong way, but people do still think one way is better. Don’t get discouraged if you are making a lot of these blogging mistakes. It’s only natural as most bloggers jump in with no prior experience and a lack of guidance. If you’re making any of these mistakes, refer to my previous blogging tips posts for help or post your questions in the comments below. If you see your blogger friends doing this stuff, share this post as a subtle hint. This is a great list, I had trouble with the keyword usage at the beginning and now that I have some experience doing basic SEO you can see how important keywords and long tail keywords are as they drive organic traffic. For sure, you simply cannot expect much search engine traffic if you’re not effectively targeting good keywords. Some people just assume that they’ll fit in solid keywords naturally but they don’t realize that you shouldn’t be always competing for the most competitive phrases. Nice breakdown Jeremy. The one thing that I made sure not to do was have unrealistic expectations. I have run blogs before, so before starting my new one, I knew what I was getting into. It is a long battle when blogging. It is extremely helpful to have that kind of perspective when just starting out. That way you treat it like a marathon instead of a sprint. You’re much less likely to burn out if you go in expecting a lot of work and a lot of time. Great list Jeremy & spot on as usual! These are all important, but that expectations one is huge – which is much of the reason why many give up after not seeing the progress they want. The truth is that it takes a lot of time and work to build something up of value. Far too many bloggers do give up in the first 6-12 months. I’m sure many are disappointed at the lack of money coming in, but I know a lot weren’t expecting blogging to take up so much time. I definitely think that some bloggers are trying to monetize too early. I wake up with probably 5 emails a week asking why after one week they haven’t made any money yet. UGH! lol sounds like those people are really in a rush. I have a feeling that they won’t be able to stick around for the long haul with that kind of impatience. My biggest mistake was to blog in a cave for 3 months. I didn’t look for ways to promote my blog and traffic was low. I’m sure lots of bloggers take that approach not realizing it’s the way to go. At least during that time you were able to hone your writing skills. Then I bet this post will be rather helpful for you. It’s only natural that new bloggers would be doing a lot of this stuff without any real guidance. Good reminders for those that have been at it awhile and need a refresher too! Networking was the best thing we did for our blog and something we need to get back to! Yes some of these things can be reminders for more experienced bloggers. Sometimes people get in the habit of doing things the same way without stopping to realize that there might be a better way. This is a really good list jeremy. I think greed gets in the way often for most new bloggers. They think that they are going to be able to quit their day job right away. With any website that I have started I have never taken much of a profit in the first year. It’s better to put anything you make right back into growth. I’m not surprised that many new bloggers think this way when they see other bloggers publicly posting how much they are earning. When they see those figures it’s easy to overlook everything that went into making that money. And I totally agree that a lot of the early income is better off invested back into growth. I know I always make a point of investing some money back into my blog. Great tips, and definitely worth it to follow these. A blog is a lot of work and people need to have patience to work through all the kinks and learning curve that goes with it. Indeed, the learning curve can be steep depending on your what kind of skills and experience you bring to the table. You’re bound to be learning a lot during the first year or so either way. This is a great list. I find myself making some of the mistakes you listed, but I’m learning to avoid them. I think the one that hit home for me was being shy with fellow bloggers. Often times, I feel like I’m bugging them or intruding, but I’m sure the majority of bloggers wouldn’t feel that way. I was a little hesitant to reach out to fellow bloggers early on too. I thought I could only get their attention via commenting and a bit of social media engagement. Really though, reaching out to them via e-mail is by far the most effective method. Thats really a great post. But i really doubt of trying to monetize too early point. I still feel if you wanna make money, why not from the 1st day. Anyway, the article is too informative. People can try that approach, but why bother if you are unlikely to make money early on? It just leads to wasted time and frustration. You can get so much more momentum for your blog if you don’t worry about making money for the first while. Awesome tips Jeremey! Many of these are things that I could definitely improve on. Hopefully the other tips will be useful to you. This is a great list! I had fairly low expectations when I began but I did not do a good job at marketing and I had to get over being shy with other bloggers. I’m actually a bit nervous now, having been blogging for a year, towards moving in the direction of monetizing my blog. I don’t know if that will be viewed as negative or not by my readership. Don’t be too nervous about it Brian. If you somehow lose readers who don’t like your blog monetized, it’s not like you’re really losing much. You likely wouldn’t make money from them. Sometimes you just have to do what’s best for you and do more of a marketing push to make up for it. I might have to hit you up for some tips! Looking forward to seeing your redesign Mark. I’m sure it will turn out great considering who is handling it. Well done mate, great post. I have learned over the past year and half so much about blogging. I did read blogging for dummies and do research ahead of time but there is so much to learn. My first blog posts are scary as is my design but that’s all about to change for the good with the re-launch soon. I have met so many amazing bloggers willing to help, yourself included and I agree building the rapport and helping each other out goes much further than simply commenting. You keep talking about that new design Mr CBB, but I’m wondering when it will actually be launched. It will probably be a solid improvement. It just seems to be taking longer than it should. As for first blog posts, I’d hate to look through my first posts to see how bad they are. I know my approach has evolved a lot since then. As a new blogger I really appreciate this advice. I especially appreciate the introduction to http://compfight.com It looks great. I actually learned about that tool about a post I previously wrote about finding blog images. It was suggested in the comments and is much easier than searching directly through flickr. Jeremy, I really like how much emphasis your series puts on networking with other bloggers. It’s very reassuring for new bloggers (like myself!) to hear that it’s OK to contact the more established bloggers, and that those bloggers actually encourage these relationships. Your posts in this series are always very helpful, so thank you! No problem Alexandra. Networking with other bloggers is very crucial, but beware that some more established bloggers become a bit snobby. So they may be less helpful to newer bloggers. I love this series, and this is a great post. I love reading insight from established bloggers, it helps put things into perspective. I am trying to just focus on building relationships and blog posts at this point. There is no way I would consider monetizing my blog right now. I think you are right that it is easy to get disillusioned when we read posts by others saying they made X amount from their blog. Blogging is not an easy task, but I’ve been enjoying the interaction with others a lot, which makes it worth it. It does help a lot to have something besides money motivating you to keep going. That way you’re less likely to get impatient when the money doesn’t come in right away. If you actually enjoy blogging, it’s so much easier to stick with it for the long haul. I really had no expectations starting out other than to get out of debt and stay out. I think sharing with the world has certainly helped me there. I also was determined to blog for a year, which is coming up very soon. I think if you are like me and know nothing about design or online marketing, you have a much steeper learning curve, and I hope to start working on more of that stuff for the next year. I think you are completely correct not to expect too much too early and how important network connections are. Most bloggers have been really receptive and more than willing to help, like yourself, and I really appreciate that. Congrats on your upcoming 1 year blogging anniversary Kim. Sharing with the world definitely does create a lot of extra accountability for dealing with stuff such as debt. Good luck on your next year of blogging and taking on the more technical challenges soon. Great tips Jeremy. I agree with connecting with fellow bloggers and marketing as they I feel are the most important. A lot of people get stuck with the numbers game and how much traffic they are getting. I know sites I have worked with that only get 5k visitors per month and they are making serious money. Targeted traffic so they are usually there to get what the site is offering. You are going to please everyone so find your niche, set some goals and get to work. I always tend to ask questions if I dont know something. Bloggers in the community are always willing to help you just have to be willing to ask. There is a lot of hardwork going on that most people dont know about and dont want to do but it needs to be done to be successful. I am still working and know that success is still aways out there. Good point about targeted traffic Thomas. I know all about how much important targeted traffic is than overall traffic. Still I do think it’s a good idea to watch your stats early on so that you have some marketing goals to push you to improve. Those stats might not help your bottom line, but they do usually help snowball other areas such as your SEO and your connections with other bloggers. I definitely used a really ugly theme for way too long. So glad I got that taken care of! I think your new theme looks great Holly. The previous one wasn’t too bad, but it did lack a bit of professionalism. This is great! Having just started my blog, and having never done anything like this before, this info is really helpful! It truly is a lot of work but it’s a lot of fun too! I’m definitely going to go back and read some of your earlier posts. Thanks! No problem. Definitely take the time to read the rest of this series as it is full of advice specially tailored to newer bloggers. You’re sure to learn a lot. I agree with the trying to make money from a blog to early. You need to build up a good fan base and a good community before you can consider making money. If you are blogging on a topic that is needed and interesting in time you will do well. That fan base and community is so much easier to build up when you’re not bombarding them with ads too. The kind of traffic you have early on usually isn’t interested in ads anyway. Ideally you are able to build up your blog enough to get search engine traffic for people actually looking for those products. You’re right, you most definitely could have expanded it to 20. One of the absolute basics in my opinion is just writing something that flows well and is free of any spelling or grammatical errors – that, for me, is the very least I’d expect to see when something gets published online. Unfortunately, far too often that just isn’t the case. Perhaps I’ll eventually do a part 2 post if I can come up with enough good mistakes to add on. Quality writing is pretty important too, but I admit I don’t always have the time to proofread what I write all the time. Thanks for writing these tips! I’m definitely going to have to re-evaluate things. It’s a slow process plodding forward but I’m learning as I go along and having fun writing! That’s good that you’re having fun. It is a lot to learn, but if you’re connecting with friendly people it makes it a lot more worthwhile. 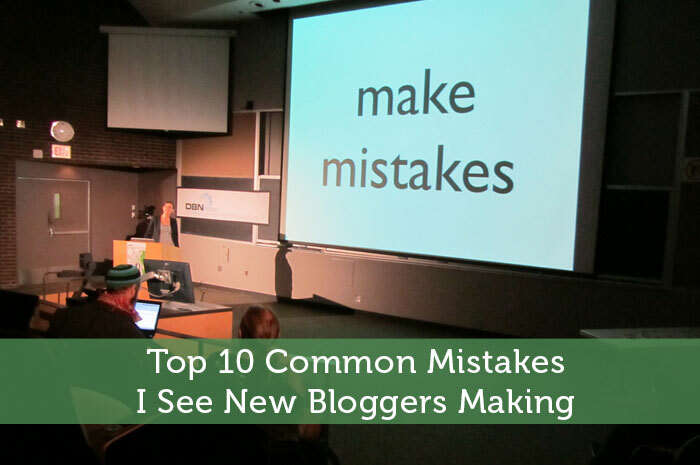 Great points; there are lots of mistakes that I made that I see newer bloggers making. Monetizing early isn’t necessarily a problem if it’s just slapping an adsense box somewhere on the site like everyone else has, but when I talk to someone starting a new blog the first thing they want to do is make money and they throw everything at it thinking something will stick – from affiliate to amazon book reviews to 3 adsense boxes. It’s key to focus on content and the money will follow. I agree that something simple like AdSense is no problem early on provided that it is taking minimal time to manage and you don’t stress about the low income. I know I made the mistake of trying to monetize right away expecting something to work a bit, but learned my lesson quickly. I couldn’t agree more with you, Jeremy. If you’re a new blogger and are committing some, most, or all of the mistakes indicated in this post, don’t feel discouraged – instead think of how you can avoid committing the same mistakes again so you’ll get the results you desire to have for your blog. Cheers! Yup it’s all a learning process and pretty much everyone makes some kind of mistakes with their blogs along the way. Absolutely. And learn from those mistakes. I needed a list like this when I first started out blogging. It would have been helpful to know that I was going to mess up on each and every one of these. I think the important thing early on is making connections. Everything else is something you can grow into. Without getting that great feedback or reaction from your audience, it makes it hard to stick with it. I could’ve used this list myself too. I committed several of these mistakes early on. When I first started I was more concerned with getting exposure everywhere rather than building connections. Jeremy, THANK YOU for this!!!! As a newer blogger, I am loving this series and the help it provides, especially as someone who is more than a bit computer illiterate. Very helpful – thanks! No problem Laurie. That’s exactly what it’s for. I’m glad to help new bloggers after all the help I received while building up my blog. Although having a quality blog posts is very important, there are indeed a lot more things to do aside from that and that is indeed the first common mistake most bloggers have. Being interactive enough with fellow bloggers and with the followers of your blog are equally important as well. It’s not surprising that interaction is so important with blogging since that is one of the major benefits of this medium. If someone only cared about writing quality content, they might be better off writing books. That sounds like the amateur SEO’s approach to blogging. They try treating it like a regular website and forget that blogging is a different beast. You can’t expect to build up a blog properly if you aren’t going to treat it like a blog. I never realised just how much other bloggers would be willing to help you out until I reached out to the community. Now I have a couple of really good friends who are always happy to help me out. I wasn’t expecting that side of blogging either. I figured everyone would still treat each other as competitors. It’s important to have that kind of support, especially early on. Great list! I find that I didn’t plan to do as much marketing as the whole job requires. I easily spend about twice as much time marketing as writing posts. I’m trying to force my brain to realize that I probably won’t really make money at blogging for the first 3-4 years. If I can stick with it that long and continue to publish great content, then if you’re lucky things may take off from there. I’m sure you’ll make money quicker than 3-4 years if you’re already spending twice as much time marketing as writing posts. Then again if you do take that approach you really could develop a solid following during that time. I find that making money in your 2nd year helps spur on the motivation. Great post! Ha! I think I’m guilty of every single one of those mistakes. But it’s a good reminder of all the work I need to be doing on my blog. Other than Twitter, I haven’t really joined the Social game. You’re right about blogging being time consuming! Had to turn mine into a weekly blog early on, as it was just getting too much, and out went all the traffic. But I enjoy it! Thanks for all the tips! Social media is a great platform to interact with your readers and answer some of their questions or just “hang out” with them! Great post Jeremy! I have infact made a lot of these mistakes. I spent so much time in the initial days trying every ad network out there not realizing that without traffic, none will convert. Also, I am yet to fully leverage blog networking and building relations with fellow bloggers. Even though my blog does decent traffic and monetizes fairly well, I hate the lack of engagement (comments and social) because I never focussed on it enough. One thing I WAS keenly aware of was the use of copyrighted images. So I just use my own artwork. And I use that word in the loosest of ways.